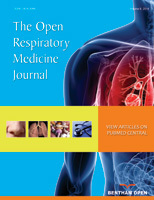 The Open Respiratory Medicine Journal is an Open Access online journal, which publishes Research articles, Reviews , letters and guest edited single topic issues in the field of respiratory medicine, aiming at providing the most complete and reliable source of information on current developments in the field. This journal publishes open access reviews on recently published books (both print and electronic) relevant to the journal. Publishers and authors of books are invited to contact our book reviews editor at tormj@benthamopen.net with book review requests. All submitted books will be reviewed by an independent expert in the field. No page charges will be levied to authors for the publication of book reviews. A Study protocol describes proposed or ongoing research, providing a detailed account of the hypothesis, rationale, and methodology of the study. We encourage all authors who have their articles published in the journal to also submit the full length article when it is ready. If the study protocol is a clinical trial, authors are advised to register their trials in a “Clinical Trial Data Base” and forward the registration of their clinical trials to the editorial office during submission of the manuscript. Gorecka D, Gorzelak K, Sliwinski P, Tobiasz M, Zielinski J. Effect of long-term oxygen therapy on survival in patients with chronic obstructive pulmonary disease with moderate hypoxaemia. Thorax 1997; 52: 674-9. Antonelli Incalzi R, Marra C, Salvigni BL, et al. Does cognitive dysfunction conform to a distinctive pattern in obstructive sleep apnea syndrome? J Sleep Res 2004; 13: 79-86. Lang TA, Secic M, Eds. American College of Physician. Philadelphia: 1997. Leigh C, Androula N, Vitali P. Physica Status Solidi (A): Proceedings of the 3rd international conference porous semiconductors - science and technology; May 2003; WILEY-VCH Verlag, Berlin, GmbH, Germany; 2003. Zhu Q, Spinelli JC. Cardiac rhythm management system for edema. United States patent US 7191000. 2007 March. All authors must strictly follow the guidelines below for preparing illustrations for publication in The Open Respiratory Medicine Journal. If the figures are found to be sub-standard, then the manuscripts will be rejected.